Collaborative piece of Margaret Bailey and Nancy Denmark. The natural coloration and graining of this cedar is rare with a flame-like iridescence compounding the symbolic Holy Spirit imagery with the flame-like dove. The Holy Spirit is the power of God "in motion" in man. The most frequent representations of the Spirit are the descending dove and flames. There are biblical accounts of the Holy Spirit appearing as a dove at the baptism of Jesus, and as tongues of fire when the Apostles were filled with the Holy Spirit. This is the 3rd cross we have made with this Spirit In Motion dove. 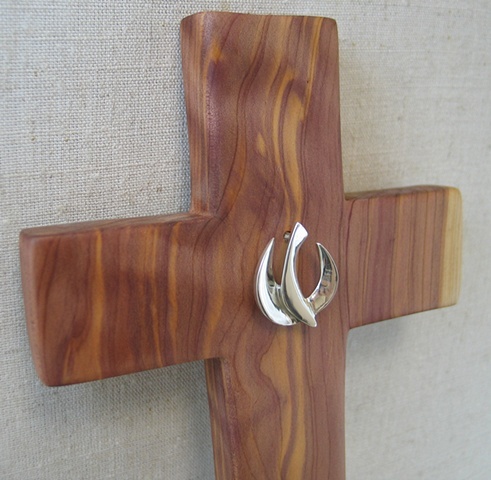 We look for special pieces of wood that communicate the Holy Spirit by the flow and movement we see in the wood grain.